I love to draw and I love to paint. When I was introduced to acrylic pouring, it had a significant impact on my life. Primarily, it renewed my interest and desire to get back in the studio and create. Then when I discovered how fun it is, I was hooked—well, fine, addicted (see my last article). Within months, I was looking at some of my pours and wondering “what else” I could do with them. So I attempted painting trees over one pour, then another and another. 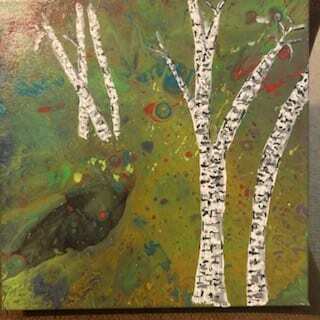 I decided to experiment with birch trees because they were white and would really show up nicely on a dark pour, of which I had many. Finally, when I finished one I really liked, I posted it on the Acrylic Pouring Facebook group. Well, I got a lot of favorable feedback, and you know me—that just encouraged the narcissist in me to do more. Tell me you like what I do and you’ll eventually have to tell me to STOP, because, like Forrest Gump, I’ll just keep going and going! Man, you should have seen my head; it was HUGE. I was so thrilled to receive the compliments and to be asked to demonstrate my technique so others could do what I’ve done. I told her that I would get right on it. It was gratifying, so naturally, I took her request to heart and here we are. I sat down at my art table in my studio (a.k.a., the desk in the middle of my living room) and began to collect all my supplies and prepare my tripod (newly purchased) and iPhone so I could share my embellishment skills with the world. I visualized tens of thousands of artists sitting in front of their canvases while constantly checking their Facebook feeds for my newest article. 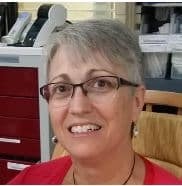 Okay, maybe not tens of thousands, but it was fun to joke with my husband about my fans “waiting on me.” I’m a 57-year-old grandma; it doesn’t take much to float my boat. I took this request quite seriously because I wanted to make my new friend Maggie proud. 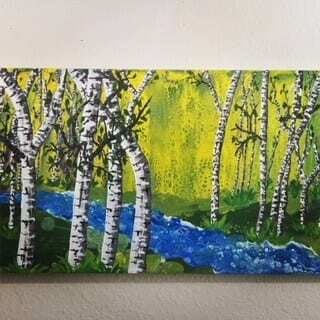 I recorded myself painting the most lovely birch trees. They were probably the most beautiful ones I’ve ever done. It took me most of the day to record because I kept the lesson slow, methodical, and very detailed so that basically anyone could pause the video at any time and recreate what I had just done. I was quite proud of myself. When the painting was completed, I attempted to upload the video to my editor at AcrylicPouring.com, only to learn that I had one segment that was too long. I mean like The Gettysburg Address too long. I couldn’t upload it to save my life. I had three small segments at the beginning and two at the end. This particular segment was the bulk of the flippin’ lesson. I called my daughter in Russia (she’s very smart) to ask for her advice—no luck. I downloaded an app that said it could help me trim and slice (no pournography jokes, please) a video—no luck. Well, I’m sure someone with some technology savvy could, but it was way over my head. I struggled for four or five days attempting to upload this monstrosity, to no avail. I finally decided my sanity was more important than salvaging this #[email protected]%*-ing video. So I deleted it and sulked for a day…well, maybe three. When I finally got tired of feeling sorry for myself, I went back to the studio and tried again. This time with notes and timers all over the place to remind me to keep checking the camera and ensure I did not go over 10 minutes per segment. I must admit, my heart was not as committed this time, as I had put my everything into the first attempt. I had to really work hard to make this video friendly and light, because emotionally I was just exhausted from my lost 28-minute video and the past two weeks of total failure. If you have a question about this particular lesson or about acrylic pouring in general, please let me know in the comments. I really do love painting these beauties and hope you will, too. Pay it forward. If you like an artist’s work, tell them. Whether it’s on Facebook or in real life—at your neighbor’s home, at festivals, wherever. Sure, buying someone’s work is great—exceptional, really—but a genuine compliment goes a long way. If someone takes the time to praise your work, don’t throw the compliment away (“Aw, no it isn’t”) or (“Well, I’m just a beginner”). Simply be gracious and say thank you. If you don’t know how to use electronics properly, don’t give up. Ask a 10-year-old. They will hook you up. If you are recording yourself, try to keep the video under 10 minutes per segment. Your formation reminded me of that, and made them all the more convincing. Also wanted to give you kudos for sharing your less than perfect canvases…sometimes I think I’m the ONLY one who has failures. If you enjoy pouring videos, I recommend Gina Deluca…..really, really amazing…nice lady too! How kind of you to say. I’m very pleased to know that it looks realistic. Thanks so much for the birch tree video. It was such a fun project to do. Great clear instructions and video. Oh how sweet. I’m glad it was helpful.